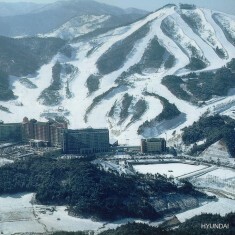 Sungwoo Tunnae Resort | Sungwoo Tunnae Resort | Ecosign Mountain Resort Planners Ltd. In 1993, Ecosign was commissioned by Sungwoo General Leisure Industries Corporation, a division of Hyundai Corporation of Seoul, South Korea to prepare a ski area master plan for a property they owned approximately 85 kilometers east of Seoul. The work at Sungwoo involved the siting and specifications for all lift systems, the detailed design of all pistes including layout plans, grading and drainage plans, and the recommendation for snowmaking coverage. 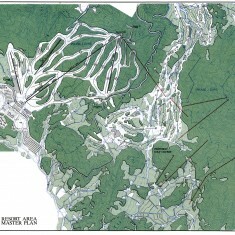 The grading and drainage plans for the ski pistes have successfully withstood the impact of heavy rainfall generated from typhoons that have frequented the area. After the master plan was completed, the Hyundai Corporation completed construction of this major resort in a period of sixteen months. During the first year of operation, the area experienced over 350,000 skier visits and by the second year, this number had increased to over 450,000. Ecosign was then commissioned to assist in the planning of Phase 2 of the resort to increase the capacity for the added business that was experienced.